AWARD’s RESILiM-Olifants Programme is funded by USAID and focuses on resilience-building in the transboundary Olifants River Basin, shared between South Africa and Mozambique. The Olifants is the largest contributor of water to the Limpopo basin. 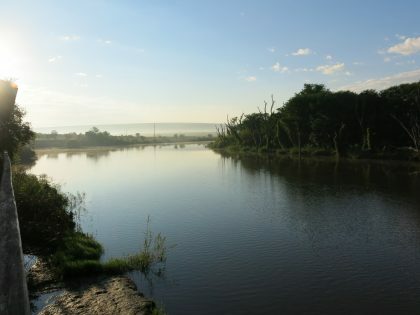 The Olifants River Catchment, or ORC, is of particular concern because of the wide-scale threats to biodiversity and the ecosystem services that support people’s livelihoods. 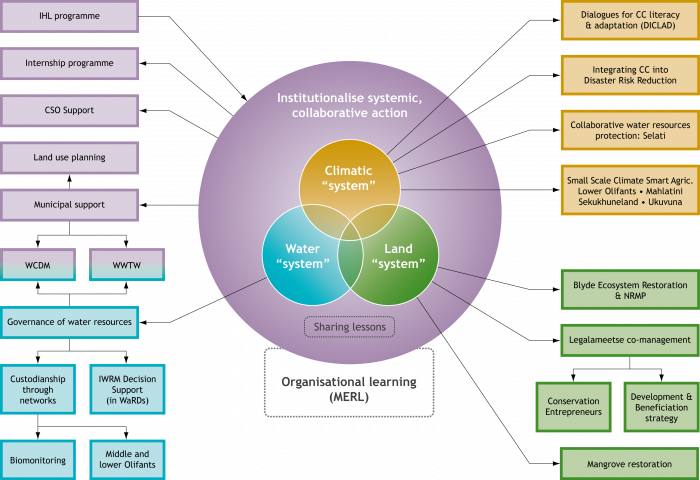 The overarching goal of RESILiM-O is: “To reduce vulnerability to climate change through building improved transboundary water and biodiversity governance and management of the Olifants Basin through the adoption of science-based strategies that enhance the resilience of its people and ecosystems through systemic and social learning approaches”. Currently the RESILiM-O programme comprises 19 projects which address AWARD’s core focus areas of climate, water and land “systems”. These are shown in the diagram below. Most are funded by USAID but AWARD collaborates with other partners for sub-grant projects. Click the on image below to find out more about each of the focus areas and their projects.